So you’ve decided to venture into the world of Resin Bound installation but you’re not sure what you need to get started? This page outlines the essential Resin Bound tools needed for your kit. Even better, we can supply them all! Please get in touch for more information. A 110v Drill and Paddle mixer is used for mixing the Resin (Part A) and Hardener (Part B) prior to adding it to the aggregate in the Forced Action Mixer (see below). We recommend a Drill and Paddle mixer with a large plaster paddle head. This should be used on a slow speed setting to ensure thorough and even mixing. The slow speed will also prevent over mixing which will pump air into the resin causing it to froth. Similarly, if you use a smaller paddle head then you will need to mix for a longer period which will over mix the resin. The tool will also generate more heat. This heat warms up the resin and reduces your working time as higher temperatures speed up curing times. A larger paddle keeps the resin cooler because the resin and hardener are able to be mixed thoroughly in a shorter space of time. 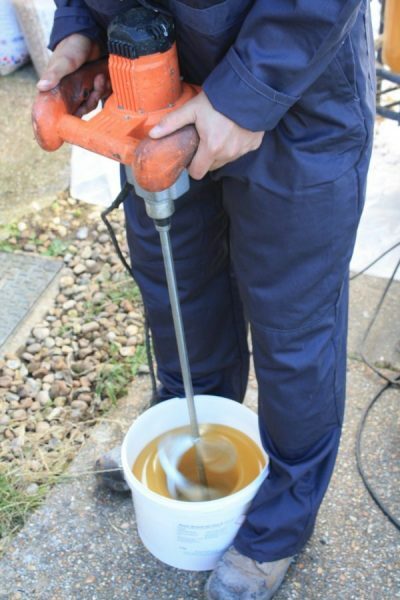 You must use a Forced Action Mixer for Resin Bound installation. Belle cement mixers are not suitable. Why? Due to the way the material is mixed in the drum; the blades in a Forced Action Mixer reach round the entire drum to ensure all of the aggregate is coated evenly throughout the mix. Consequently, this helps to avoid any dry or overly resin-rich patches in the finished surface. Cement mixers do not do this sufficiently and, as a result, will cause a noticeable patching effect where areas are too resin-rich or resin-dry. The Forced Action Mixer you use will require a large capacity drum. For our standard sized kits this would be 110 litres. This is essential to fit all of the materials for a complete Resin Bound mix in at once. 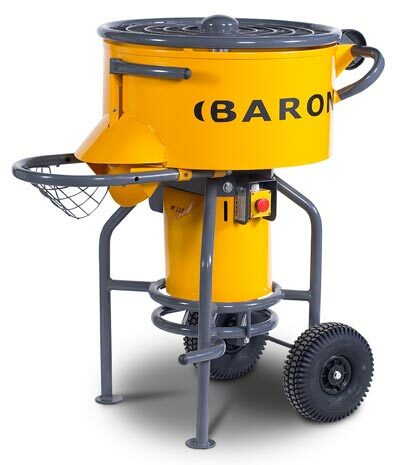 We are sales agents for Baron UK hence we recommend the Baron M110 Forced Action Mixer. See specification below. For full technical spec click here. 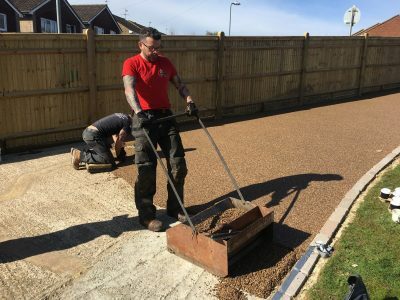 Trowels are essential Resin Bound tools for installation; they ensure that the material is well compacted onto the surface to achieve a smart and durable finish. 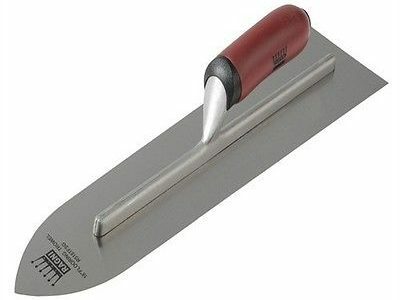 We supply 18″ Ragni Flooring Trowels with a soft grip handle for comfort. In our experience, these are best trowels for Resin Bound installation. 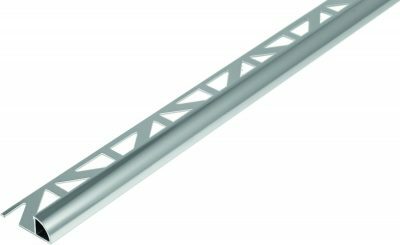 They are versatile tools; while the flat end is ideal for reaching materials laid up to flat walls and edges, the pointed end is perfect for corners. 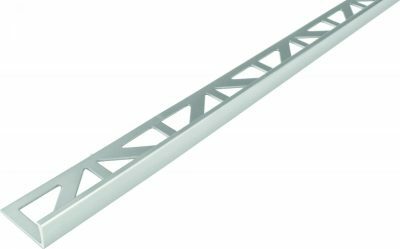 Once broken in, the Ragni 18″ Flooring Trowel is durable and flexible, and over time the sides of the trowel will curve upwards slightly which will streamline each stroke across the surface. Our RB Solvent Cleaner is a highly efficient solvent used for cleaning uncured resin off tools and equipment during and after installation. Use the solvent to wipe down your trowel with a brush as you’re working to keep it free from residue and stop the steel from transferring onto the stones. This is especially important when working with lighter coloured finishes. Furthermore, RB Solvent Cleaner doesn’t leave a film on the surface that alternative cleaning solutions will do. Screed sledges are useful Resin Bound tools used to distribute the mixed materials evenly over the surface at the appropriate depth ready for trowelling. 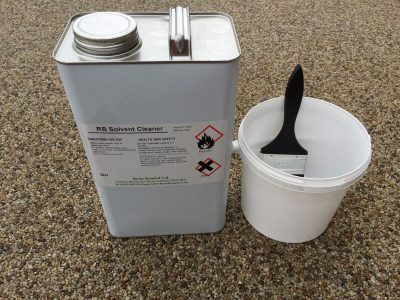 First of all, once the mixed resin driveway kit is ready, release it from the mixer into a wheelbarrow. Next, fill up the sledge, which has been pre-set to the desired depth, and drag it across the surface to release the materials. Using a sledge speeds up the process of installation and gives uniform coverage whilst also taking pressure off your arms and shoulders. There are several types of Edging Strips used in Resin Bound installation. They all have different functions. 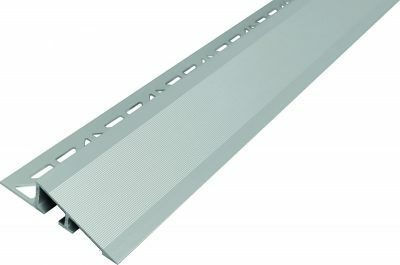 Standard edging strips provide a solid edge to lay materials up to. Similarly, they can also be used as a day joint if you can’t complete an area in one day. Aside from that, they are also perfect for dividing up sections where different finishes are being installed. 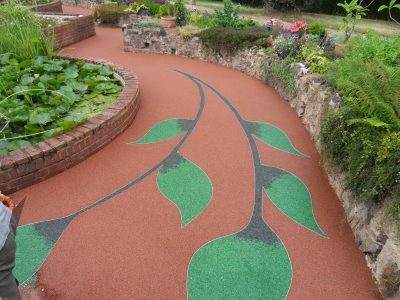 We supply these standard strips in either straight or flexible forms which provides endless possibility to use Resin Bound materials in a really creative way. You can add a border, house number, logo, and other designs to create bespoke surfaces and set your work apart from others. 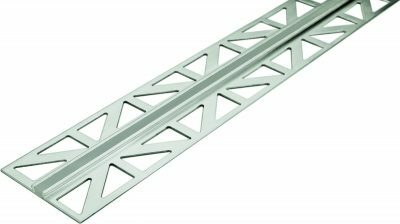 We also supply Bullnose Edging, Step Edging, Ramp Edging and Expansion Joints. Expansion joints are available in various colours to match the finish you’re installing. Need any advice? Call us on 0800 772 3030 and we would be pleased to help.